Te Wharu Bay Self contained Unit is situated on a lifestyle block on the harbour edge in a peaceful garden setting well off the road up a long driveway separate from the house. 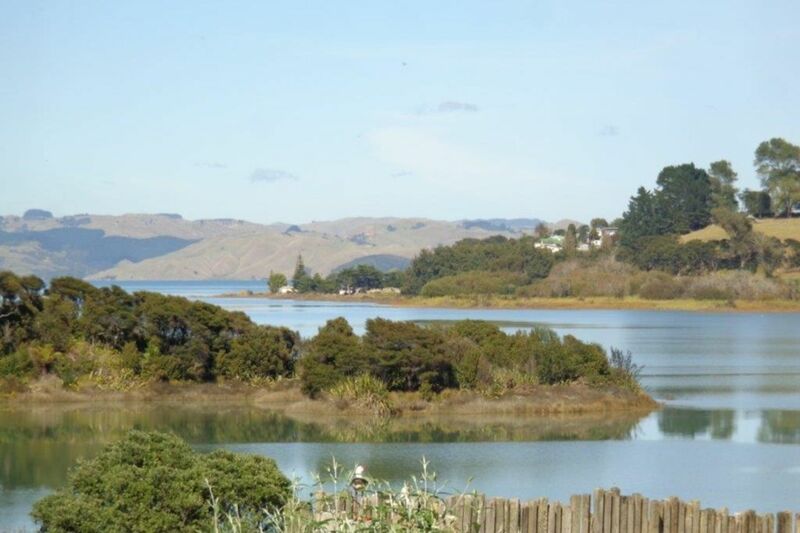 It is 3km to the village of Kawhia where you will find a Museum, cafe, Local Arts and Crafts Shop, Fish and Chip Shop, Service Station Superette, General Store, Hotel, Boating Club, Sports Club. You may wish to bring your horse, (check first, more suitable in summer. )We can supply a paddock for $25.00 per night per horse and parking for your float or truck. There is excellent riding just 3kms away at low tide with parking at boat ramp for your float Send hubby off on a Fishing Charter for the day and ride to your hearts content!.Fish off the wharf or surfcast off the beach, harbour or ocean. Enjoy a soak in the Hot Pools (Te Puia Springs) you have dug at low tide at the ocean beach (7kms) and watch a spectacular sunset. Kawhia Ocean beach is a great place for a long beach walk. Aotea Beach and harbour also offers good fishing, nice walks and is 8km drive.Swimming at the jetty along Kaora Street is a favourite pastime of the locals in the summer or watch the youngsters jumping off the wharf. Should you wish to venture further afield you will find Waitomo Caves and Blackwater rafting 60 minutes drive away, also Raglan with Bridal Veil Falls a short detour, an hour away. Otorohanga Kiwi and Native Bird House is a 45 minute drive. Kawhia has often been described as our west coast secret, where time stands still, removed from the stresses of modern life of big towns and cities. A good place to chill, relax and enjoy at a slower pace. Optional with prior approval, bring your own horse $25.00 per night for paddock supplied. Room to park float, truck. Pets allowed with prior approval. Bring pets own bedding as not permitted on furniture please. Preference given to bookings of at least 5 days over Christmas/New Year period..
We have lived here for many years & built the self contained unit 15 years ago. We have two dogs who live here. An elderly spaniel plus a super friendly staffordshire terrier. We are trying to retire, hubby is now a part time plumber & I am a part time grandmother! Private ( apart from owners who live on the property) location, no traffic noise, lovely garden setting with picturesque harbour views. Bring your book, relax. Cleaning fee included, also linen. Wash & dry your own dishes please. Bring your horse! Paddock supplied, $25.00 per day per horse. Good riding at low tide on ocean beach. You can also bring your pet by prior arrangement . ( no dogs allowed on furniture so please bring your pets bedding) Cleaning fee & linen provided but we expect you to wash & dry your dishes. 3 kms from Kawhia village. Nice harbour view in pretty garden setting. Harbour edge. Please note, 'muddy':) Kawhia wharf is 3 kms away, main road. Te Puia Springs, Ocean Beach Kawhia where the hot pools are dug at low tide is a 10 minute drive. Small fridge with ice box. Ideal get away for a couple, in lovely garden setting with awesome harbour views. Relax & recharge here, away from the busy world out there. Yvonne and Mike are the perfect hosts, very friendly and helpful. Yvonne and Mike are the perfect hosts, very friendly and helpful. The cabin is great with everything that you might need. We fully recommend Te Wharu Bay for a peaceful chilled break. Wonderful lookout over the harbour with the flocks of Canadian geese flying overhead the only sound. Wonderful lookout over the harbour with the flocks of Canadian geese flying overhead the only sound. Great base to explore Marakopa Falls and the fossils at krirteihere beach. Very restful. Lovely place to stay. The stand alone unit had everything we needed, we had our own little patio to sit outside and enjoy the surroundings. Yvonne has a beautiful garden and I enjoyed observing the numerous Monarch butterflies and birds in the trees as well as the ever changing tidal Kawhia Harbour. The sunsets were pretty spectacluar too! A must-do is Ocean Beach at low tide where you can dig your own hot pool - spades were provided at the unit which was appreciated too. Very comfortable and well presented. Very comfortable and well presented. Just feels a bit like being in a goldfish bowl as there is not a lot of privacy. Great quiet private location. Handy to town, lovely views. Great clean well presented property, 5 star. Will return. Exactly as described, heavenly location! Ideal get away for a couple. Note, cleaning is included although you are expected to wash & dry your dishes. Explore & discover 'back in time' Kawhia, nearby Aotea beach or good base for some day trips too. Raglan is an hours drive on scenic route ( some gravel), Waitomo Caves.